safety first- that mean we must use helmet in our head. no helmet - we will get a ticket from highways police (extra money will spent). motorcycle can be separated from this motor helmet gear. so get trendy with cool helmet is best solution. don't be shy whith use this motor gear. The fashion of motorcycle riding has stood the test of time and has remained unchanged over the years. No matter how many new models of car are out in the market, the trend of riding stylish motorcycles is still very much in vogue. Even today, a stylish motorcycle rider steals the show as against any other vehicles on the road. Motorcycle riding is synonymous to style, and speed, and when it comes to stylish motorcycle riding at a high speed, the right kind of motorcycle apparel comes in the picture right away. With the increasing number of people taking into motorcycle riding every day, appropriate motorcycle apparel becomes mandatory to ensure the safety and comfort of the motorcycle riders. With several new companies joining the old ones in manufacturing motorcycle apparels every day, it can be difficult to choose the right motorcycle gear. The first step towards choosing the right gear is to know the primary items that constitute to be the right motorcycle apparel. The five primary things that are considered to be essential for motorcycle riding are helmet, clothing, eye gear, chaps, and boots. While shopping for motorcycle apparel, you need to ensure that these things are a combination of appropriate functionality, style, and safety. 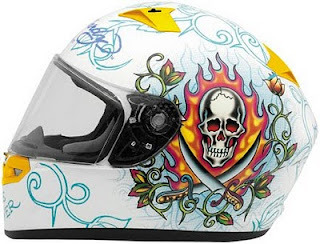 Among all other motorcycle apparels, helmets are of primary importance. Helmets not only add style and attitude to the rider's personality but also protect the head from accidental injuries. Helmets are thus, mandatory for speed bikers as well as regular bike lovers. Due to the importance of helmets, several companies are coming up with new designs and models of helmets to combine safety and style. Bell helmetand Shoei helmets are two such reputed brands that are known for their quality and features ensuring safety, comfort, and style. Based on KBC VR-2 helmet. Bag-molded for shell consistency, strength and lightness. KBC Ultra-Quick Removal shield mechanism. 2.2mm OPCC (Optically Perfect Complex Curve), scratch-resistant anti-fog shield. Internal comfort lining designed for comfort and noise reduction. Microfiber developed especially to wick away moisture. Controllable air ventilation and cooling system.